Digital Humanities, Libraries, and Partnerships brings forward ideas and reflections that stay fresh beyond the changing technological landscape. 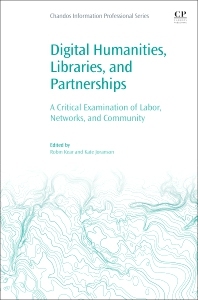 The book encapsulates a cultural shift for libraries and librarians and presents a collection of authors who reflect on the collaborations they have formed around digital humanities work. Authors examine a range of issues, including labor equity, digital infrastructure, digital pedagogy, and community partnerships. Readers will find kinship in the complexities of the partnerships described in this book, and become more equipped to conceptualize their own paths and partnerships. Robin Kear is a faculty librarian at the University of Pittsburgh liaising with the English Department, the Film Studies Program, and the Gender, Sexuality, and Women’s Studies Program. She has been in the library field for 17 years, written numerous articles and book chapters, presented nationally and globally, and keeps professionally active in national and international organizations. Most recently, she is serving as an IFLA International Leader and a member of the American Library Association’s International Relations Committee. Current subjects of interest include digital humanities, digital scholarship, bibliometrics, international librarianship, advocacy, library as publisher, and scholarly communication. Kate Joranson is the Head Librarian at the Frick Fine Arts Library at the University of Pittsburgh. She cultivates engagement with arts collections through curriculum development, research, exhibitions, and collection data projects. Kate has been a librarian for 10 years, and worked as an educator and museum professional prior to her work in libraries. In addition to her MLIS, she earned an MFA in painting and drawing. In her expanded practice as an artist and a librarian, she explores the intersection between discovery and creativity, through collaborative projects such as What Does it Mean to be Curious?, ebrowsing.org, as well as a series of studio projects at katejoranson.com.